Life In Plastic: Who Is Octavia? 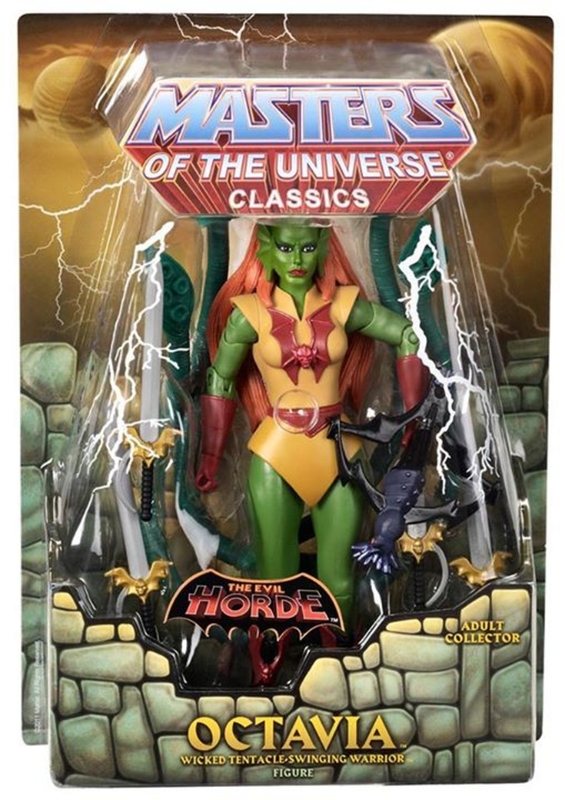 Hey guys, it’s been a while since I’ve posted about a new obscure Masters of the Universe Classics figure, but since June’s figure is a cartoon-only henchwoman from She-Ra, well… here’s Octavia! People really don’t realize how progressive She-Ra was. It was an action cartoon with a primarily female cast that, despite being pretty girly, didn’t only pander to girls. It was still about a resistance group fighting their monster overlords – and yeah, a lot of cartoons got oddly dark at the time (see: Rainbow Brite), but She-Ra managed to keep about the same tone as her older brother, He-Man. 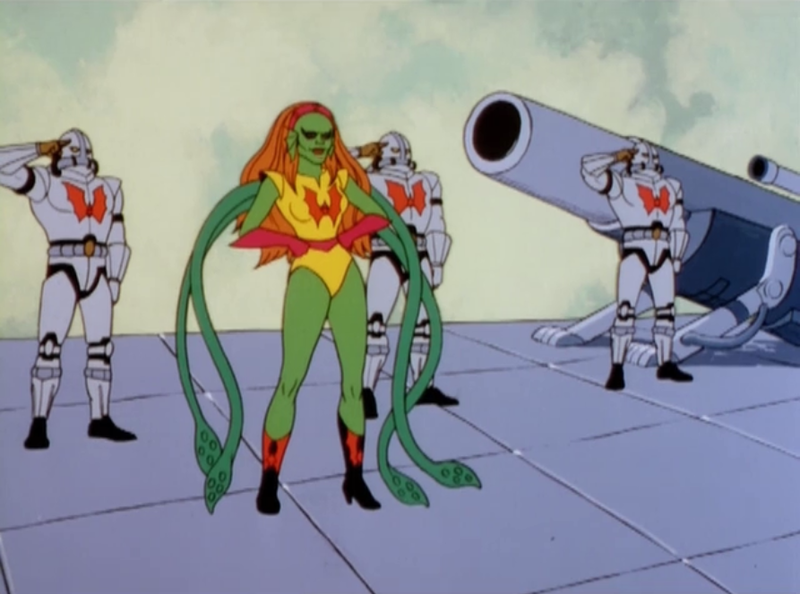 Although the cast wasn’t all female, She-Ra: Princess of Power did have a lot more girls than He-Man’s cartoon, including more than a few female villains. Those ranged from Shadow Weaver the cloaked sorceress to Catra the not-Catwoman, to Scorpia, who looked really cool but was voiced by the female version of Lenny from Of Mice And Men. Poor Scorpia. The unpredictable waters of the Etherian seas are home to many sea creatures, none more dangerous and cunning than the aquatic warrior Octavia. Working her way up the Horde ranks, she eventually became a Horde Commander, first in her home waters of Octopus Cove and eventually serving Hordak in the Sea of Sigh and the Fright Zone. Truly enjoying a good fight, she cackles shrilly while brandishing weapons in her four thrashing tentacles. Octavia uses her tentacles to hold weapons and capture her enemies, squeezing their bodies into submission. 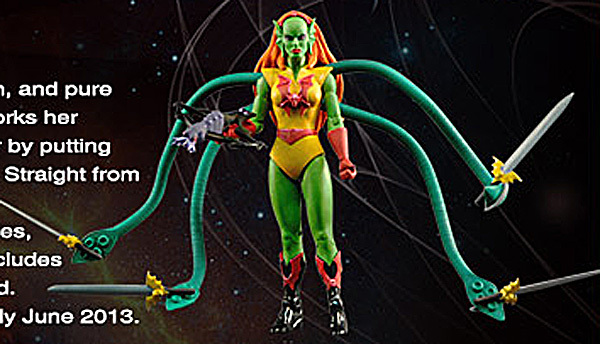 Well, that’s pretty basic – no special story info, just a quick look at who and what she is. Octavia outdoes a lot of the other Filmation-only characters (like Fang Man, Icer, Batros, etc.) 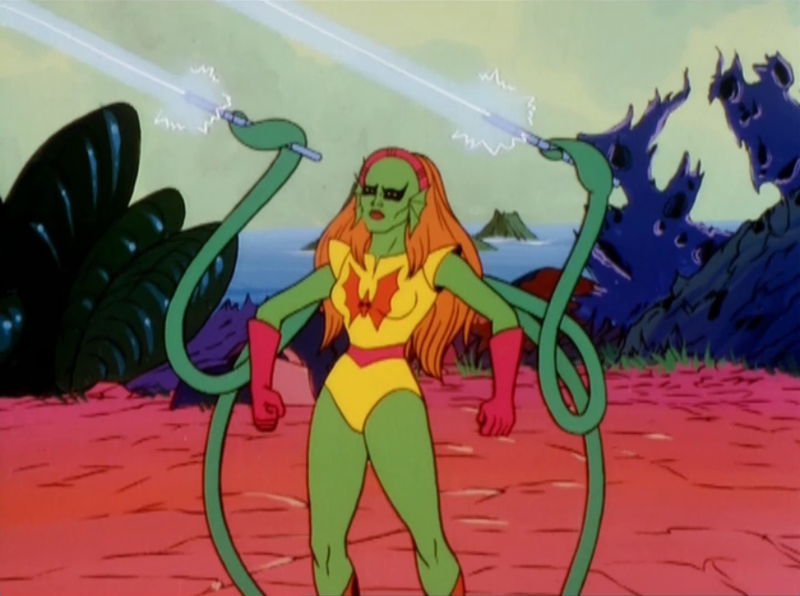 by actually appearing in TWO episodes, one per season – Treasure of the First Ones and She-Ra Makes A Promise. You know, I really love She-Ra’s old-fashioned upper-class Hollywood accent. Seriously, you just don’t hear that anymore. 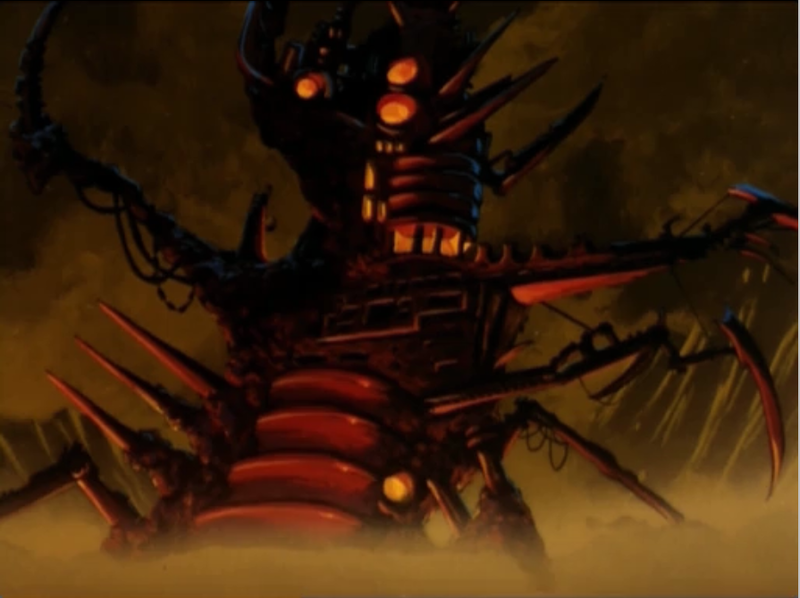 Treasure of the First Ones was a fairly basic episode, opening first with some amazing scenery paintings, and then Hordak saying “I don’t know what to do today! There’s just so much BAD to do!” Oi.. oh, right. The main plot is that the Mystic Isle of the Ancients is going to rise above the waves, and it has treasure and stuff, so Hordak wants it. Well, it was either that or stomping more kittens. It’s also a good excuse for Sea Hawk, Adora’s pirate-ish love interest to make an appearance. You know, the pirate who doesn’t rob or murder anybody. As for Octavia, she’s already on Hordak’s payroll – her introduction is when he goes to fetch her to help him take the island. Octavia looks really intimidating until she speaks, since she sounds kind of like a drunk Carol Channing on helium. And slurping every other syllable. You know, she’s kind of attractive. I mean, I know theghy tried their best to make Octavia ugly, but it just doesn’t work. Even her voice doesn’t really get in the way. I should probably stop thinking like this. Okay, anyway, people get to the island when it rises. This isn’t a scene-by-scene recap like the Fang-Man review was, since we’ve got twice as much ground to cover. By the middle of the peisode, Octavia’s just spent her time standing around Hordak, but we finally get a fight at the 12 minute mark! She commands robots at first, but then holds a bunch of ice guns in her tentacles and freezes Swift Wind with them, so that’s pretty cool. 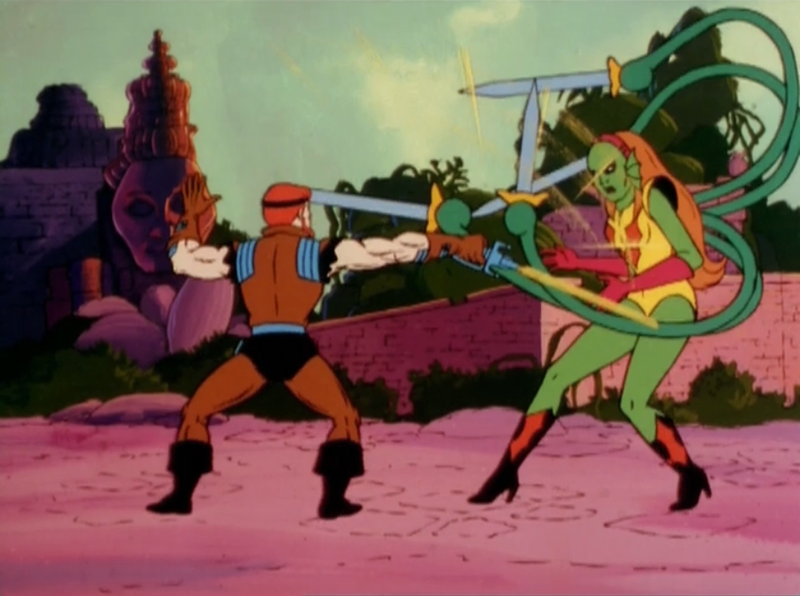 She-Ra abandons Sea Hawk to fight (or flirt with) Octavia alone, and they end up in a Harryhausen-esque swordfight that actually looks pretty good for this series. Really good. Sea Hawk almost wins by Jumping Out Of The Way, but Octavia snags him in her tentacles and does something vaguely inappropriate and unsettling before She-Ra jumps in to save the day… by breaking Octavia’s swords and then throwing her in the water. Which of course totally defeats Octavia, because she gets attacked by sharks. I am not making that up. Hordak finds valuable treasure, and then throws a hissyfit because they weren’t weapons, The day is saved! Okay, the day is saved after She-Ra stops Hordak and Octavia (she’s back!) from blowing up the island with a laser cannon. They do that by throwing a mountain at it. Anyway, octavia made a pretty good showing in her first appearance by making short work of Swiftwind and Sea Hawk, although though beating up non-She-Ra characters isn’t much to brag about. She-Ra Makes A Promise is an important episode about… uh, promises. I guess. The episode opens with those weird little purple…things…and…all the cute and fluffy creatures hanging out with Bow. They all argue about food because like half of them eat bugs and the others eat “Golden Spuffles,” or whatever they are. Anyway, Sprocker, the fat purple whatsit who I swore ws meant to be female has a crush on Adora (still might be a girl. This cartoon IS progressive, after all), so fatty runs off to go find some spuffles, because he wants to die. And yeah, he gets captured by Octavia, but it’s really not her fault since he had managed to fall into the river all on his own. Really, Octavia just saved Sprocker from drowning. Her voice is oddly worse now – it’s not as shrill, but it wavers a lot and is really and uneven, and you can barely understand what she’s gurgling out now. Hordak is unimpressed, but he’s got an idea! he’ll ransom the useless smurf in exchange for She-Ra, only freeing Sprocker if She-Ra gives herself up. This is quite a conundrum. If SHe-Ra does nothing, then Sprocker will probably die. 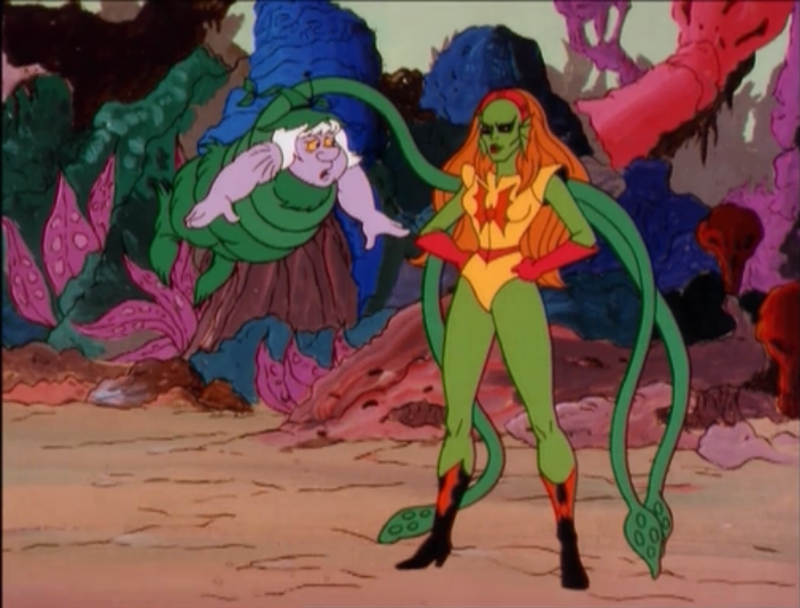 If she gives herself up, then Hordak has free rein to take over Etheria and kill everybody else, including Sprocker. Of course, she could also just punch Hordak in the face until he releases Sprockle, so… She gives herself up, like an idiot. 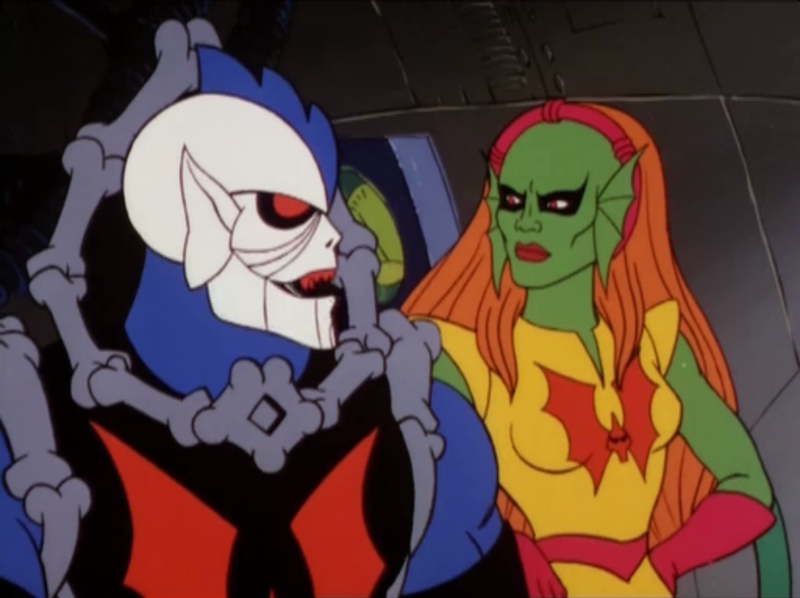 But hey, Hordak promises not to attack the Rebellion, so… heh. She’s still a moron. Well, that was kind of disappointing. So, Octavia is fairly capable and tough, and a great fighter, and makes a cameo in a second episode. Good for her. I hope that helped inform your decision to buy this gal or not when she goes up for sale on June 17!